Saturday 12th January saw another successful and well attended Burngreave Messenger volunteers get together. It was great to see so many volunteers in attendance, many of whom I hadn’t met before. What the gathering illustrated to me was the wonderful diversity of the Messenger volunteers – people of all ages, backgrounds, and nationalities contributing towards a common local goal. From a Nepalese political activist, a newly published Hungarian author, to a theatre producer and a multilingual Yemeni former airhostess, the breadth of life experience present was astonishing. A party game prompted some interesting stories from those present, such as meeting Kenny Dalglish in Cyprus to an unfortunate volunteer being trapped in a jacket that was stuck in the doors of a tube train. Richard Belbin gave an insightful talk into the founding of the Messenger, its development, and the future of the paper. He asked for suggestions on how the Messenger can respond to new challenges and the needs of the community it serves. 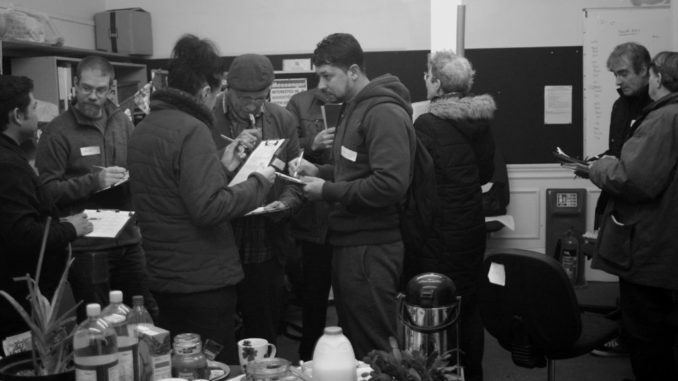 The gathering then moved across to the People’s Kitchen Pitsmoor party which was being held in an adjacent community room. Here, Ange Droz was cooking up a storm with some incredibly tasty Pierogi – dumplings of a central/eastern European origin, in this case filled with a delicious vegetarian mix. Meanwhile on an large table shadow puppet models were being enthusiastically constructed for the shadow puppet show held later on in the day, which was greatly enjoyed by all. A big thank you to all the volunteers at The Burngreave Messenger, and to People’s Kitchen Pitsmoor.